Have you got $2.99 put aside for a rainy day? 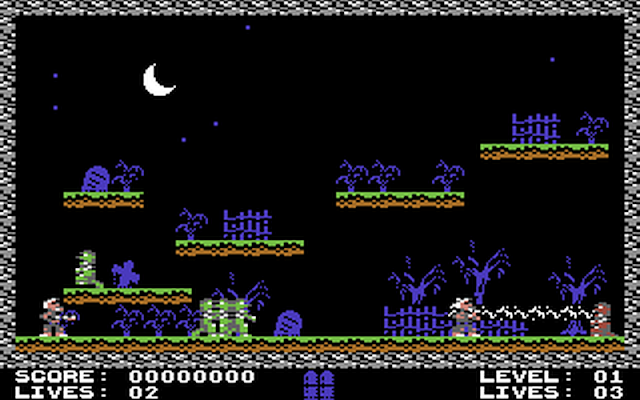 Then come and play Georg 'Joe Gunn' Rottensteiner & Trevor 'Soulless' Storey's spooky action arcade game ' Guns 'n' Ghosts ' for the C64! Play as a choice of 1 to 2 player supernatural hunters on a mission to battle through over 70 screens filled with menacing Zombies, rattling Skeletons, bats and other nasty's befitting to a creepy game. Can you send the horrors of the damned back to where they came from? Featuring power up weapons, mini-cut scenes, an animated end sequence and the musical talents of Richard 'TND' Bayliss. Guns 'n' Ghosts is available from Psytronik Software as a budget C64 disk (presented in a glossy colour disk sleeve with full colour label + instruction sheet) and on tape (presented in a clear cassette case with full-colour glossy inlay). A C64 cartridge version is also available from RGCD. Check it out, it could be a great addition to your C64 library!